Mobile phone services for sports stars and celebrities - offering a personally managed account service available 24/7 with complete discretion and additional billing security. Talking to Spotlight Telecoms we quickly realised the industry they are in required a brand which would reflect the high quality service they offer. We created a responsive website & range of marketing materials to present to prospective clients. We took time to understand the target audience whilst working with Spotlight Telecoms on their brand, where they see it in their industry and in the future. We developed a brand strategy to ensure brand integrity within a single voice. We looked a range of different styles & ideas which would suit they company ethos the best. We decided on using the spotlights at the main part of the logo accompanying it with a nice font using blue & grey as the main colour palette. Being a telecoms company it was important that the website worked across a range of devices, we developed this to enable that happened without impacting on data & the user experience of the website. 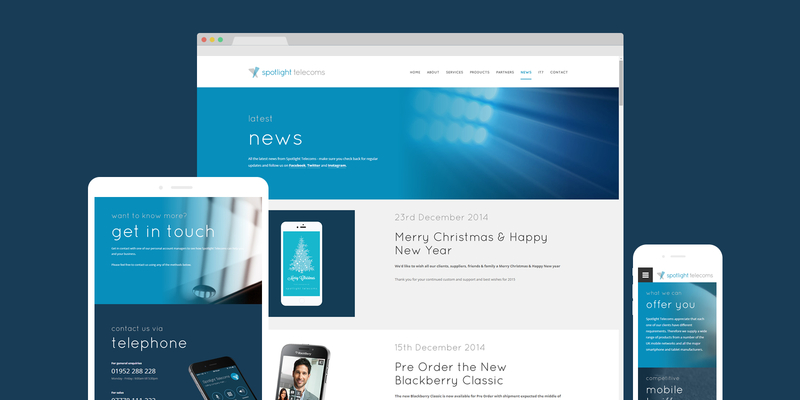 With a lot of industries seemingly phasing out print marketing, Spotlight Telecoms is embracing it more. We have created a range of marketing materials such as brochures, business cards, tariff guides & more recently professional looking Christmas cards. With Spotlight Telecoms having both office based and roaming staff, it was important that communication between the two wasn't effected. We branding & designed an internal intranet to enable communications for the entire company. Having a stable internal platform is as important as having a working website, using Office365 for email & document storage enabled this to happen, which was accessible to the company securely on line. The website, branding and marketing materials have been excellently received from their clients now are a major player in their industry that is growing year upon year. 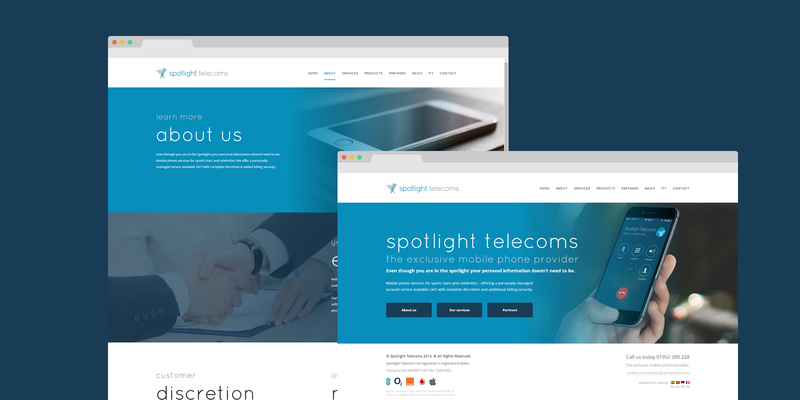 We have helped establish establish brand Spotlight Telecoms within their industry and now the brand matched the professional company and the equally professional service they offer. An increase in ease of internal communications has helped increase sales & service due to SharePoint enable easy access to the "office" any where and any time. "What we have done now is place ourselves above our competition with our brand, website & marketing - that's all from the creative ideas & hard work of Pink Petrol."